Vulcans are often asked about their eating habits offworld. Known to be staunch vegetarians, particular about alien cuisine, and for not eating lunch,1 Vulcan guests can cause a great deal of apprehension in their hosts. Because the harsh climate of T’Khasi did not allow for a wide variety of foodstuffs to be grown throughout most of its history, traditional Vulcan cuisine tends to be simple and unvaried. Unlike other races, Vulcans are perfectly content to eat the same fare day after day. Although they are unaccustomed to variety, heavy sauces, and spices, there is no cause for alarm. Vulcan-like dishes can be easily created using similar ingredients found on other worlds. Here is an example that Terran bakers should find appealing and easy. A typical Vulcan breakfast of krei'la and gespar juice. A typical Vulcan breakfast features krei’la,2 sometimes spelled kreila or kreyla in Federation Standard English. 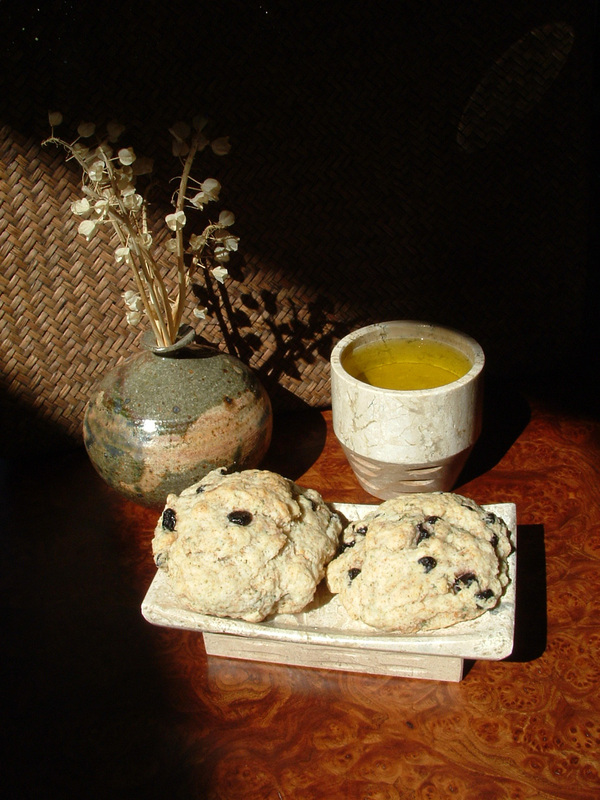 In most Vulcan societies, krei’la resemble Earth’s scones, but in some locations, the word krei’la is used for a type of flatbread.3 The following is a recipe for the former type. The basic krei’la recipe is satisfying and wholesome on its own, but an embellished version can include dried hirat, a fruit akin to grapes, and fresh or dried lhm’ta, an herb which has a taste that reminds many Terrans of lemon. Use dried blueberries instead of raisins to more closely approximate the flavor of hirat. For another version of krei’la, substitute dried and diced apricots for yon-savas and fresh, diced sage for the Vulcan herb eshi in the same quantities as above. Nothing grown on Earth tastes like the yon-savas (fire-fruit) of Vulcan, but the flavor of the apricot blends surprisingly well with sage. For mornmeal3 or breakfast, many Vulcans drink gespar-masu, the juice of gespar, a fruit grown in the temperate zone of Kir Provence. The juice is pictured here in a cup dating — along with the traditional math or plate – to Surak’s time. 1Lorrah, J. (1984). The Vulcan Academy murders. New York: Pocket Books, p. 28. 2 Bonanno, M.W. (2010). Unspoken truth. New York: Pocket Books, p.322. 3Lorrah, J. (1984). The Vulcan Academy murders. New York: Pocket Books, p. 28. 4 The way of kolinahr: the Vulcans. (1998). Culver City, CA: Last Unicorn Games, p. 46. This entry was posted in Food, Traditions and tagged krei'la, kreyla, mornmeal, Star Trek, Vulcan cuisine, Vulcan mocha. Bookmark the permalink. wa’itaren na’ “recipe’. Ahh someone posted my morning breakfast. 😉 A savory version is possible too. May I give a copy of this to a friend? Sanu — by all means, pass this recipe along to your friend and to whomever else might be interested. If you have Vulcan recipes to share, you are more than welcome to do so here. This is quite good. Thank you for posting it. Zakashtaya t’oT’Khasi.. Taurak ta ma n’yeht va’er isha. Cha’i t’naat heh t’klem ka-wak. Wa’itaren. Dor-tor du nash-veh k’tuhkskayalar. Istau goh nash-veh dor-tor oT’Khasi. I most certainly will. I’ve a few in mind. Shall I send them via E-mail? Please forgive the double post. I also agree with what oBriht’uhn has said in the above post,I cannot express it as well as he yet. Yes, feel free to email me. I can feature your recipes in future posts and give you credit for them, of course. So far, this post has been the most popular. Everybody loves food! I have a plomeek soup for you. I’ve included variations to suit any tastes. I can E-mail it to you it you wish,it’d be a bit large to post here. Sounds delicious. Please email it, along with any photos of your creation, if you have them. You’re welcome. Food is the heart and soul of most cultures. I’ve observed that when I’ve partaken of a culture’s unique fair, and asked for recipes,the ones who’ve made it are more than gratified. No images of my plomeek soup yet, no digital imager around. Just made these. Very good. I made modifications since I had only whole wheat flour and dried mango. I added cinnamon and cardamom(a sweet spice). Made house smell good,and the cat wants to eat one. I used fat free plain greek yogurt. It has the texture, and taste as sour cream but not the fat. I’m cosidering seeing how I can make these with other forms of grain, maybe quinoa, or teff or something similar. They have difficulties digesting gluten? If so,that’s a problem. Unless the grain grown is similar to barley or something else non wheat related. I’ll look around for compatible grains. I’ll do some searching, since Vuhlkansu grains had to be patterned after real life earth grain. (Unless there’s something going on around here. 😉 ) Many grain here actually are gluten free, plus highly nutrietive. Maybe some of those can be baked with. Did you locate your bowl yet?